Metal Silhouette Heron Outdoor Light from Smart Solar. New Metal Silhouette Heron ideal as a simplistic addition to any garden. 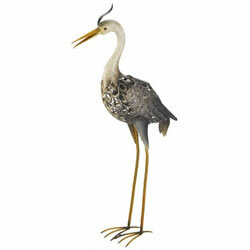 New Metal Silhouette Heron ideal as a simplistic addition to any garden. This heron stands 81cm tall and are great for decking, lawns and around any garden water feature. The spotlight lights automatically at night and highlights the features of the silhouette. Integral solar panel that powers the animal at night. Operating time of up to 6 hrs on a full charge. 1 white and 1 colour-changing LEDs per heron.